If you love garlic, you will love this dish. If you don’t like garlic give it a go, because there are other strong flavours in the dish to help keep the garlic under control, like cinnamon and coriander to list a few. Also the garlic flavour is reduced by the boiling of the broth and if you believe the experts it’s also very good for you. This meatball dish is very versatile as you can use any minced meat. This time I am using pork, but I’ve also done this dish, with chicken and turkey meat and see no reason why it won’t work with beef or lamb. The worst part to this recipe is to remove the juices from the onion, be prepared for a sore and runny eyes. You need to grate the onion on a chopping board. Then squeeze the grated onion to remove the onion liquid. You need to squeeze it several times until the liquid is almost gone. If you don’t do this, the meatballs will not stick together and will fall apart in the broth. 1 onion, grated and squeezed. Put the meatball ingredients into a bowl and mix together, best to use your hands. Then make up 12 meatballs and put to one side. In a large pan, add the chicken stock, water and bring to the boil. Then add all the other ingredients and cook for about 15 minutes. Then add the meatballs and cook for another 15 minutes. 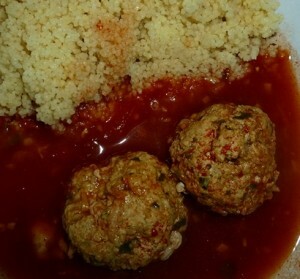 Serve in bowls with either cous cous, bulgar wheat or rice.